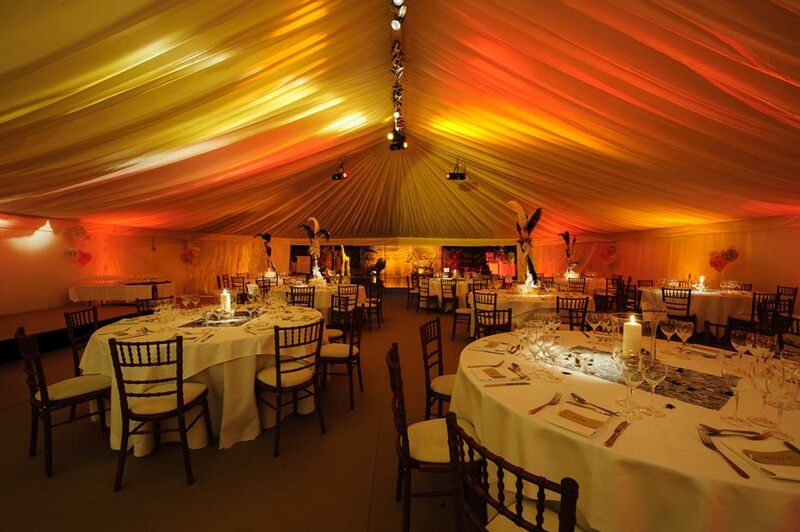 This marquee was for a 21st birthday party with around 120 guests. 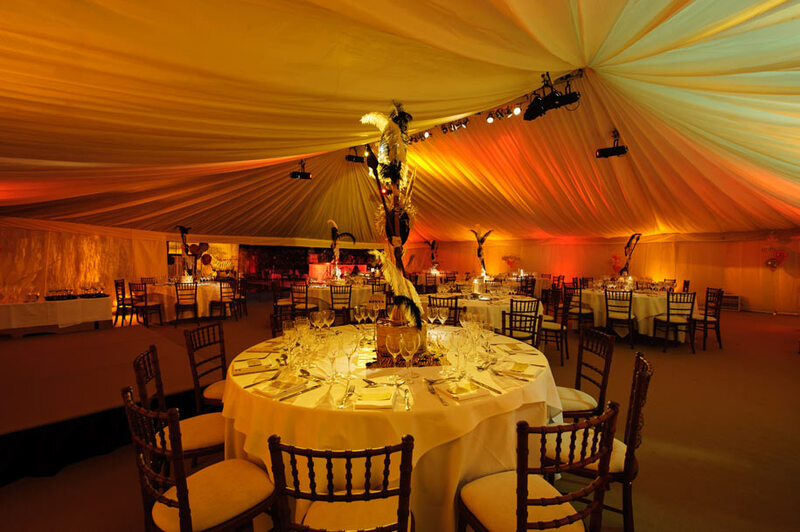 Marquee spaces allowed for a reception area / dance floor, a dining room, a kitchen area and built in loos. The site had a large power supply so didn’t require a generator, but did require electrical distribution and heating. One large marquee was partitioned to create four distinct spaces. An entrance pavilion with decking lead into the reception area. Beyond the reception area was a dining room with the loos and the catering area built in to the far end of the marquee. The reception area had starcloth roof lining and brushwood walls. We installed a coffee carpet and a black dance floor. The coffee carpet continued into the dining room, were the roof and wall lining changed to ivory. 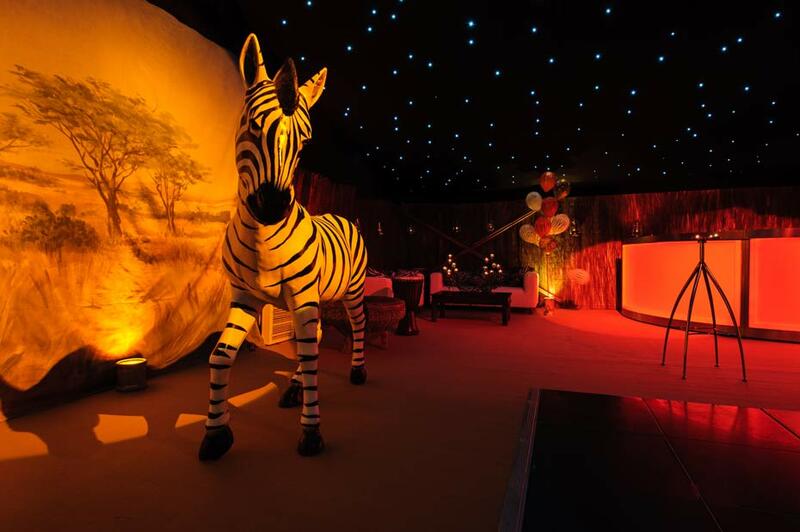 We used a lot of coloured lighting to create a sunset colour wash across the linings in this area. The marquee was built over two days, with the first day being given over to building the structure, floor and internal partitioning. On the second day the marquee lining, lighting and electrical distribution was installed. Because the loos were built into the marquee, we had to build the structure in such away that the trailer unit could be driven in and positioned. Once the loos were in situ we could seal off the end of the marquee and dress the cloak room and loos. We worked on this event with Ginny Loisel Events. Ginny organised the themeing, the loos and the furniture. 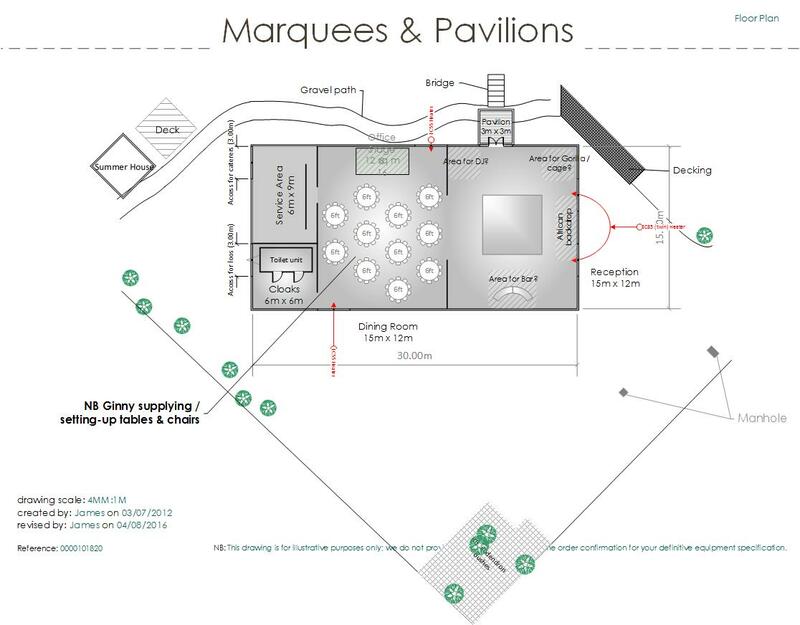 Marquees & Pavilions installed the structures, flooring, carpet and linings, the lighting, heating and electrical installation. The catering was provided by Cavendish Events. Thanks to Andrew Brackenbury for the photographs.